The Great Atlantic & Pacific Tea Company began as a mail order business called The Great American Tea Company in 1859. In 1858, George Francis Gilman took over his father's hide and leather importing business at 90 Gold Street in New York City and hired 25 year-old George Huntington Hartford as store manager. 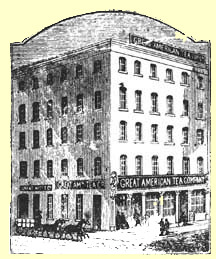 It is unclear which of the Georges first suggested undertaking trade in tea, but the following year The Great American Tea Company was founded. 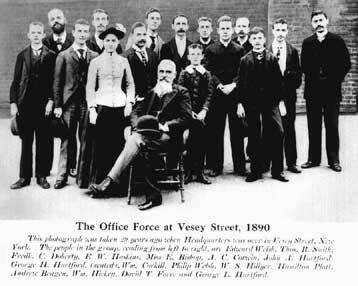 The original company headquarters was located at 31 Vesey Street in lower Manhattan. Today, another business giant stands on that site, The World Trade Center.The company grew rapidly through mail orders, wagon routes which sold door to door and the establishment of new stores. In 1870, the Great American Tea Company was renamed The Great Atlantic & Pacific Tea Company in honor of the first transcontinental railroad. At that time, A&P operated eleven stores selling tea, coffee, sugar and baking powder and also sold its products through mail order and wagon routes in 30 states. In 1880, George Ludlum Hartford (the founder's eldest son) left school at the age of 16 and began working full-time in the A&P store managed by his father. His talents for finances developed early and each day he received the envelops from all the stores and counted the entire take of the company. This was the beginning of his 75 year career with his family's company. In 1888, John Augustine Hartford began his career with A&P at age 15, traveling everyday with his brother George to the Vesey Street headquarters. John's first responsibility was filling inkwells and then helping George purchase the printed lithographs or trade cards that were given away as premiums. John remained active in and devoted to the company until his death in 1951. My brother and I have been working for the Company since we were 15 years old. We have grown up with the business, lived with it to the exclusion of all else. Our one desire is to perpetuate A&P as a great public service, to have it stand forever as a monument to the integrity, perseverance and human understanding of the man who founded it, George Huntington Hartford. The A&P was incorporated in New Jersey in 1900 with a capital stock of $2.1 million. Owner George H. Hartford and cashier George L. Hartford became President and Treasurer, respectively. 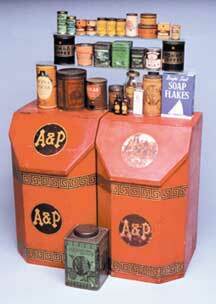 The company was growing rapidly and by 1905, 250 A&P stores had been established. The A&P was incorporated in New York state in 1916 with John A. Hartford as its President and George L. Hartford as Chairman of the Board in Charge of Finances. Both men would remain in those positions until their deaths. The following year George Huntington Hartford died while vacationing in Spring Lake, NJ on August 29, 1917.